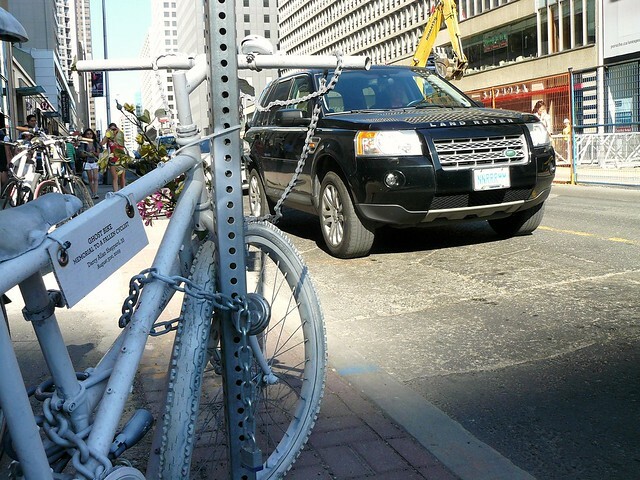 The contentious Jarvis bike lanes should be operational by the end of July. Transportation Services will be removing the reversible centre lane and hardware starting Friday July 16. Depending on who you are this will either be the end of the world as we know it, or a small addition to a street network that is safer for cyclists. My name is Geoffrey Bercarich, age 26 and life long resident of Toronto, Canada. I was attacked and held illegally by Toronto Police in the “g20 jail” on Sunday June 27th, 2010. Fences make good bike parking! A friend emailed this photo and I thought of the G20 fence. But no, these bikes are actually locked to the fence at Iggy Pop's concert last weekend in Dundas Square. But it could just as easily be bikes locked to the paranoia wall surrounding the G20 meetings, except that the G20 fence would only have the parasitic bikes until the police came to clean them off. After Councillor Howard Moscoe's prodding, City Council has released the previously confidential manual which explains who can get their parking tickets cancelled. I am glad that they did this, and it helps make things much more clear to everyone in this city. Many thanks to Councillor Moscoe, and the other councillors, who made this happen. Before this manual was released, I had though that more enforcement would help to diminish the number of vehicles found parked in bike lanes. I had also thought that on-street separated bike lanes should be used sparingly and strategically. Scun Yun aka scunny aka Hoof & Cycle, posted his questions to Mayor David Miller on Goldhalk Live and posted it to youtube. It's a bit depressing to know that the most pro-cycling mayor Toronto had in some time was able to do so little in his two terms. It's all downhill from here, and not in a fun, wheeeeeee!!!! kind of way. Car doors shouldn't have a "zone"
Last week, riding home on College Street, I encountered a territorial idiot in the bike lane. This individual decided to open his car door into the bike lane, then stand beside it chatting on his cell phone. On seeing me, he closed his car door enough to leave me six inches to pass. I told him, politely but stiffly, that I needed more room than that, and he closed it almost completely. I rolled by him. From his comments about me not leaving the bike lane, he clearly thought he had the right to use it as a substitute living room. Read more about Car doors shouldn't have a "zone"
George Smitherman, mayoral candidate, has published a "transportation plan", or, as I prefer to call it, a thinly veiled nod to motorists and patronizing approach to transit, cycling and walking. It may be easier in an era of a "war on cyclists" that a mayoral candidate can get away with a platform that does less for cyclists than what is in the Bike Plan already.